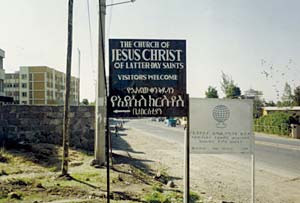 This morning we headed to church at the LDS Branch in Addis. (click to see a news story about the first meetinghouse in Ethiopia). I was delighted to see that Ashure, one of the investigators that I had talked to my first week in Addis, was blessing the sacrament. He looks very happy. After church he came up to me and we had a good chat. The branch is growing steadily. There were two more ordained to the Aaronic priesthood and one more baptized today. After church the whole group had lunch together then sat around the table sharing stories and life experiences for several hours. It was interesting to see the diversity of the group and their experiences. I am glad that we had that time to get to know each other better. This afternoon Lloyd was finally able to get in contact with his family on Skype. The video is very choppy and it drops off every now and again but other than that it works fairly well. He has talked to them for several hours. I wasn't ever able to get it to work when I was here before. I hope I can get Skype to work with my family too!